Insofar as high wireA tight, heavy metallic cable placed high above the ground, on which wire walkers do crossings and various acrobatic exercises. Not to be confused with a tight wire. artists go, the most widely known are perhaps The Wallendas. Yet, even if the original troupe of Karl and Herman Wallenda, Helen Kreis, and Joe Geiger, presented one of the best high wireA tight, heavy metallic cable placed high above the ground, on which wire walkers do crossings and various acrobatic exercises. Not to be confused with a tight wire. acts in the business between the two World Wars and in the two decades following WWII, they belonged to a generation that had been particularly rich in outstanding German high-wire artists—among whom the most notable were undoubtedly the Triska Family, and The Napoléon of The Skies, Camillio Mayer. Camillio didn’t come from a performing family, but when he saw a high wireA tight, heavy metallic cable placed high above the ground, on which wire walkers do crossings and various acrobatic exercises. Not to be confused with a tight wire. troupe give a show in Mülhausen in 1905, he decided then and there that he, too, would perform on the high wireA tight, heavy metallic cable placed high above the ground, on which wire walkers do crossings and various acrobatic exercises. Not to be confused with a tight wire.. In order to do so, young Camillio went to a nearby freight yard were he knew he could find a piece of cable, installed it between two trees, and he began training himself—learning the rudiments of wire walking by trial and error. Six months later, feeling confident enough to perform, he left home, crossed the border and entered the French Territoire de Belfort (the part of Alsace Germany didn’t annex), where he joined a French company of wirewalkers. He began his professional apprenticeship with them and, at age sixteen, he made his performing debut in the city of Belfort. Now a full-fledged high-wire artist, Camillio went on to work with that troupe and others on French fairgrounds until the advent of World War I. Being a German native and citizen, Camillio was indeed not welcome by the French authorities when the war started (at that point, Alsatians were actually considered suspicious by both countries); detained by the French, he managed to escape to Germany. There he would eventually establish his own company, and start touring the German and allied states, where he built a strong reputation. A very talented performer, Camillio Mayer was rather small and stocky but he had a great personality; after the war, his now well-recognized French background (since Alsace had returned to France) won him a nickname that was a tribute both to his charisma and his performing flair: Der Napoleon der Lüfte ("The Napoléon of the Skies"). As a matter of fact, Camillio had indeed become the "emperor of the high wireA tight, heavy metallic cable placed high above the ground, on which wire walkers do crossings and various acrobatic exercises. Not to be confused with a tight wire. ": By then, his troupe had set the standards by which other high wireA tight, heavy metallic cable placed high above the ground, on which wire walkers do crossings and various acrobatic exercises. Not to be confused with a tight wire. acts were measured. In 1934, Lotte Witte (1918-1940), a sixteen-year-old pretty brunette, joined Camilio's troupe. She was born in 1918 in Stettin, Germany (today Szczecin, in Poland), the daughter of a plumber. Fearless, attractive, and very talented, she soon became the troupe's main drawing card. Camilio fell for her, and he gave her as a "nom-de-scène" not only his family name, but also his first name: Lotte became known as Camilla Mayer. In 1936, when the troupe performed outdoors in the popular seaside resort of Atlantic City, in the United States, Lotte made the headlines performing on a fifty-three-meter-high (175 feet) swaypoleA high, flexible vertical pole (originally made of a single piece of wood, and today of fiberglass) atop of which an acrobat performs various balancing tricks., a daring feat that was heralded as a world record. Sadly, it was with a lesser feat that Lotte-Camilla lost her life on January 20, 1940, when her much shorter twenty-meter swaypoleA high, flexible vertical pole (originally made of a single piece of wood, and today of fiberglass) atop of which an acrobat performs various balancing tricks. brole during a performance of the Menschen-Tiere-Sensationen show at the Deutschlande Halle in Berlin. But Lotte had become the star attraction(Russian) A circus act that can occupy up to the entire second half of a circus performance. of Camillio Mayer's troupe, and thus two other artists would replace her as Camilla Mayer: First, Ruth Hempel, from Breslau, Germany, then for a short time after Ruth's departure from the troupe in 1943, Ruth Barwinske (1926-2005), who married a fellow member of Mayer’s company, Bob Gerry. Finally, Camilio met Annemarie Füldner in Stedten an der Ilm (near Weimar in Germany), where he had settled in 1944; Annemarie became his wife and performed with his troupe around the world as Camilla Mayer from 1946 to 1961. Over the years, the Camillio Mayer Troupe worked in circuses and parks all over Europe and the United States, and toured as far as India, Indonesia, Australia and New Zealand. His was one of the first high wireA tight, heavy metallic cable placed high above the ground, on which wire walkers do crossings and various acrobatic exercises. Not to be confused with a tight wire. acts to present the now legendary seven-man pyramid on the wire, revived much later by the Wallendas in the United States, but originated by the Triska Troupe in 1943 (and perhaps a little earlier) in Germany—at a time when Camilio was appearing with them. World War II was evidently another difficult period for Camillio Mayer. If the first years of the war were generally euphoric on the German side, it quickly changed after the Americans entered the conflict. The Allies began to gain momentum in 1942-1943 and, in the turmoil that ensued, Camillio Mayer lost his troupe and his equipment. Finally, at the end of the war, he was taken prisoner by the Russian troupes. The war over, he went to Stedten an der Ilm, where he began to train young wirewalkers—among whom his wife-to-be, Annemarie Füldner. In 1945, he revived the Camillio Mayer Troupe, which began working outdoors, and then, when circuses hit the road again, in the ring—notably with the new Circus Sarrasani, after it had been resuscitated by Fritz Mey in 1956. Camillio was indeed the manager of his troupe, but he appeared only occasionally in the act. He was in his late fifties when he resumed his career, and he generally limited his participation to the act to an old trickAny specific exercise in a circus act. popularized in the nineteenth century by Blondin: Frying an egg on a stove while balancing on the wire. Camillio did that playing a hapless cook, as a comedy bit that proved very successful. 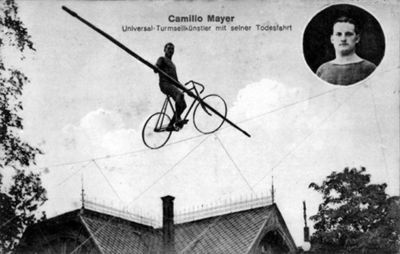 The Camillio Mayer Troupe traveled in both West and East Germany (since the country was then divided), and in France, England, the Netherlands, and Finland. In 1952 and 1953, they were featured with Ringling Bros. and Barnum & Bailey Circus in the United States, where the portly, sixty-two-year-old Camillio joyously fried his eggs on the high wireA tight, heavy metallic cable placed high above the ground, on which wire walkers do crossings and various acrobatic exercises. Not to be confused with a tight wire., to the delight of his audiences and the Press. During his stay in the United States, Camillio announced his intention to cross the Nigara Falls on the wire. It was more a publicity stunt than anything else, and the project never came close to fruition. It would have been a great crowning to an exceptional career, however. Mayer’s troupe continued to perform until 1961, and then the Napoléon of the Skies finally retired to his hometown of Stedten an der Ilm, in Germany. Camillio’s last years were marred by Alzheimer disease, and he finally passed away on May 21, 1972. In 1946, Annemarie Füldner gave birth to his only son, Ludowiko, who sadly died in infancy. From an earlier union, Camillio also appears to have had a daughter, whom he had named Camilla; she would have been the only genuine Camilla Mayer. Camillio Mayer is buried with his son in the Stedten cemetery.